I seem to remember reading, in the last 18 months or so, about a modern stone circle built, I think, in Offaly using stone from all around Ireland. But I have spent the last hour searching for references to it, without success. C'mon ponddigger Jack this is your area! There you go GG. From our very own Sunny of this very parish! You just have to know what buttons to press! Any luck with the maths problem? An event where stone masons from all over the world come together to build a dry stone structure which will be a monument to the Gathering. The Dry Stone Wall Association of Ireland and the Stone Foundation, USA have come together with a vision to invite this international community ‘home’ for a Gathering of Stones in the geographical centre of Ireland. The Gathering of Stones will be an event where people with an interest in Irish dry stone walls will come together, and under the instruction and guidance of the Dry Stone Wall Association build an attractive communal stone installation that will act as a permanent monument to all events and gatherings that will take place during The Gathering 2013. The monument, a gathering point itself, may also become a place for other gatherings and events for the remainder of the year as well as into the future. Why didnt you ask me, i was there earlier in the year, its still not finished looks like they ran out of money,Ill have a look for a pic on my hard drive somewhere amongst the other millions on there. Actually Lough Boora have a website and facebook page and there is a pic there as well. He did ask you..... and everyone else too. You must have been out cycling! Well Good Guy. Was your thirst for knowledge quenched? Found it two pics one of circle the other of train tracks reminds me of home and how our train system might look in 50 years but us country boys are used to this kind of thing everything run down. Thanks, Tagwex and Greengage. I was close by the other weekend when I was at our friends near Birr, but didn't go. The weather wasn't very conducive and there was no enthusiasm amongst the rest of the party. I went for a spin in the Slieve Blooms instead - very different from our rugged Donegal mountains. Next time, perhaps. The place really is well worth a visit, although it can be a hard sell ("What? you want to go and look at a bit of old bog?"). They have a fair few events on throughout the year, and the Offaly Naturalists Field Club usually have a few walks there (although I can't find their 2015 programme online yet). One word of warning is that it can get very busy in the summer (especially in the holidays), and they now have a new café opened. 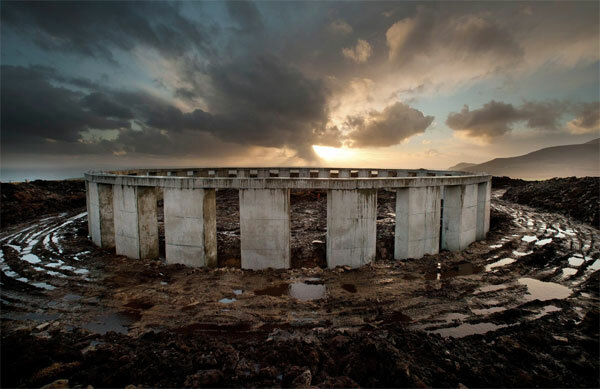 I thought you were all on about achill-henge in this topic. The Gathering of Stones will be completed by the end of this summer. In regards to the question of whether it has run out of money, will I can tell you that there never was any money to start with. This project is internally being built and organised by volunteers from the DSWAI using stone donated to the project from quarries and farmers across the country. Built by the people, for the people. There's a new stone circle, which has been built in Blarney Castle recently. The Seven Sisters. And we have the real thing near our house, the largest stone circle in Ireland. Both circles are built of Limestone. One, a few thousand years old and the other less than a year old.